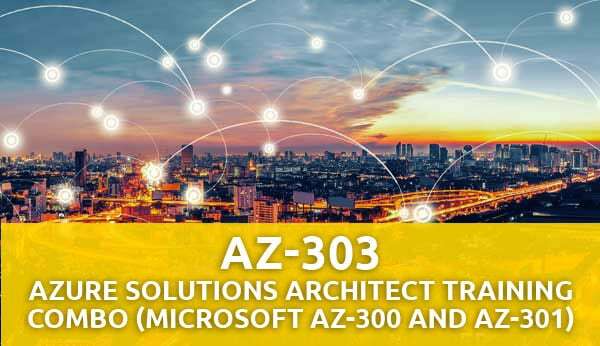 Our new AZ-303: Azure Solutions Architect Training class is a combo of Azure 300 and 301. Train for BOTH Microsoft role-based certifications in only 5 days instead of 9! Build skills to be an effective real-world Azure solutions architect. Instructor Mike Pfeiffer is a Microsoft Azure MVP, accomplished IT Architect, consultant, writer, and conference speaker with 20 years experience in the tech industry. He will share valuable experience from his consulting work on real-life projects. Get hands-on practice with custom labs in a live Azure subscription. Build highly-available applications, set up load balancers, auto-scaling, Docker containers, serverless applications and much more. Don’t miss this amazing learning opportunity. Register today! This five (5) day course is intended for IT pros, solution architects, or developers who want to master the skills required to design solutions that run on the Azure cloud platform. This course is designed to help learners gain practical expertise with Azure compute, network, storage, and security for building real-world solutions on Azure. This in-depth course covers the domain objectives for the AZ-300, AZ-301, and AZ-302 exams which prepares attendees for the Microsoft Certified Azure Solutions Architect Expert certification. We recommend that attendees have experience with general networking concepts, systems administration, familiarity with Windows or Linux, and a high-level understanding of software development. Attendees should also understand the principles of cloud computing and possess basic Azure administration skills.